Christmas comes with many tasks..
Those are envelopes that have been addressed and stamped (and apparently counted) and are awaiting the photo card that goes inside. Definitely one of the more tasky aspects of the holidays. Yeah… so… Christmas for so many years felt like one big to-do list. A hallelujah choir of a to-do list. The madonna of all to-do lists. A to-do list with tasks, tables, completion dates, shopping lists, guidelines for setting up stations and staging areas… the whole fruitcake. Mastered it, reveled in the accomplishment of hundreds (probably) of tasks, even dared think myself worthy and awesome for beating Christmas into submission. Every year, though, at some point, accomplishment gave way to cynicism. I was losing the point. I hated being on a task-driven march to the 25th. Christmas as project management started to feel stupid. What was all of this for? This was followed by years of getting mad at myself for being cynical, as in you are smarter than this, Peterson, surely you can find a way to not be victimized by the holiday, surely you can pull together enough that is sweet and personal and meaningful for and with your family to make it enjoyable, and please, dude, stop complaining, it’s so unattractive. Which, I did pull myself together. Got real. Grew up. After flogging myself so hard for so many years to get out of my head and into my heart, I’m finally starting to experience a lot more heart, a lot more spirit.. if I may say. Still have the master to-do list, that part didn’t change, but the attitude did. I’m older, wiser and so much less annoying. I still get satisfaction out of moving through tasks. But I’m actively seeking calm in the process and actively working to eliminate freneticism. Magic has become that quiet place inside. I wanted time to think. About family, about other people, just about life. It’s a great time of year to reflect. And time to slow down. 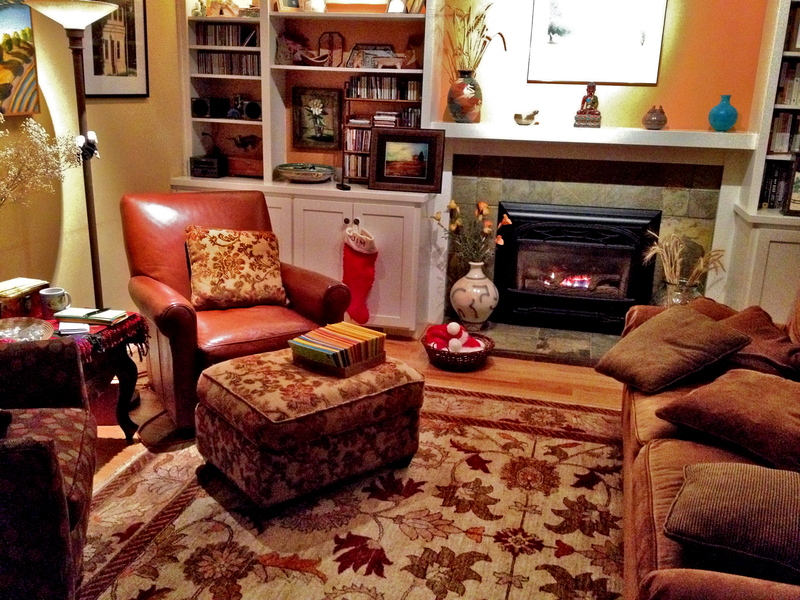 Space, too–spaces that are pleasing and nice to be in, including emotional spaces. All that helps to keep everything in perspective. For the last few years, I’ve thought about just a few traditions and worked to keep them simple. You can do it hard or you can do it easy. Choose easy. Nobody cares about perfection, such a silly word. JIm just wants me happy, Peter just wants presents. Let’s do that! Kids mature; one day with steady, gentle reminders, he’ll see a Christmas beyond presents. It will happen. I’m really liking the direction this is all going. So, talk about a staging area… hazzah! 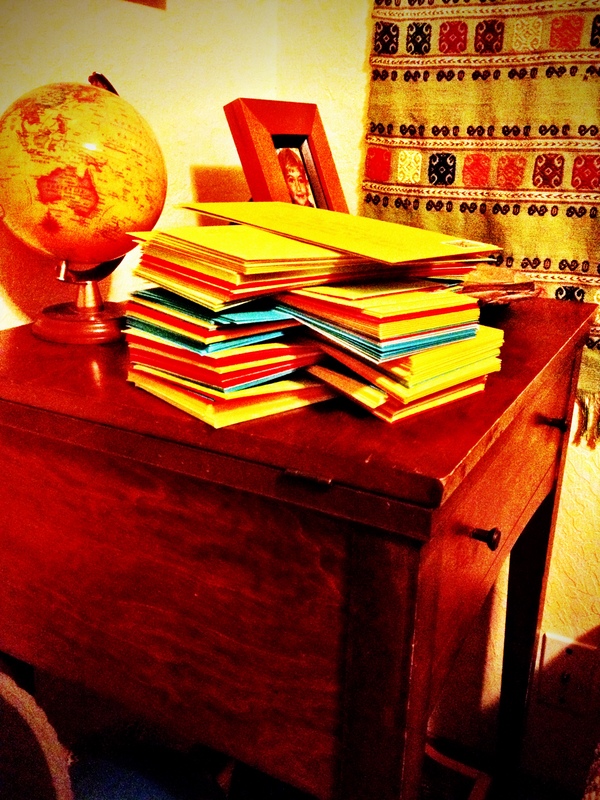 I sat here and stuffed envelopes and wrote on a few of the cards. It’s supposed to be a joyful thing, right?, connecting with family and friends, sharing a part of yourself and your life over the past year. For me, the task becomes so much more pleasant if I give it time and do it in a space I love to be in. I actually fell asleep. You’re really doing it right. Savor it as you know. This is the first year in many that I’ve been feeling a bit of joy during the season. You and I have shared our thoughts about this before…. I too became cynical. It’s a hard time of year for many, who do not have family or who have been through tough times or lost a loved one … And I still feel cynical about the materialism of the season. It really bothers me as a cultural thing. I can hone down my own little piece of Christmas and make it what I wish it would be… but visions of Black Friday and all it signifies, really scream to me that our society is out of wack. Sigh…. Yup, outta whack. Just goes to show, we gotta not listen to the loudest voices and instead make our own joy and traditions. Find the jewels where we can. They’re our rules to make.